A survey has found that one in four dog and cat owners (26%) in Europe will base their holiday locations on whether it allows them to bring their pets. With many holidaymakers looking to take their pet abroad this summer, Airport Parking and Hotels (APH) has created a comprehensive guide highlighting the different rules and regulations across major airlines for travelling with ‘man’s best friend’. The research can be found in the Know Before You Go section of the APH website at www.aph.com/travellingwithpets. The research compares the different dog breeds accepted on flights, the cost of flying abroad with a dog as well as the pet weight and crate stipulations across 20 major airlines including Air Canada, Alitalia, Japan Airlines and Singapore Airlines. Not all dog breeds are allowed to fly in a commercial aircraft, with six of the 20 airlines researched, including Air France, American Airlines and Cathay Pacific, prohibiting flying with snub-nosed dogs (such as Pugs and Bulldogs) onboard any passenger flight. However, customers travelling with Qantas Group are allowed to take snub-nosed dogs on flights which are less than five hours long. Furthermore, Aer Lingus, Delta Air Lines and Lufthansa all state that dogs listed on the Dangerous Dogs Act 1991 (such as the Pit Bull Terrier) will not be accepted on any flight. Whereas, Iberia, allows the transportation of dangerous dogs on any commercial flight as long as the dog is muzzled for the duration of the flight. The cost of transporting animals was also found to differ greatly between airlines with costs dependent on the crate size and final destination of the customer. For example, passengers flying with their pet with British Airways will be charged £89 for checking their pet into the hold compartment. However some airlines were found to charge a higher fee for transporting animals, with Swiss Air charging £272 per animal, each way. Swiss Air passengers should also be aware that if a pet is refused entry to Switzerland, the owner has 10 working days to return the animal to the country of origin otherwise it risks being put down. 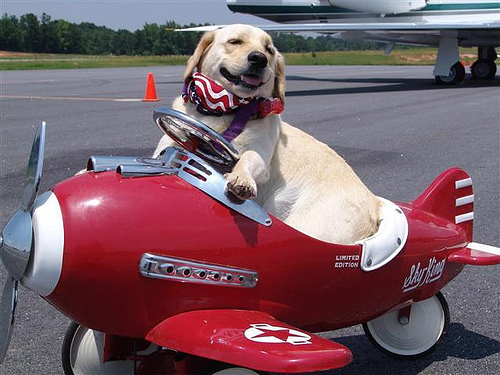 On the other hand, out of the 20 airlines researched only Virgin Atlantic offers a dedicated Flying Paws Scheme where passengers can collect Flying Club Miles on behalf of their dog.